Lounge poolside while getting lost in your favorite magazine or novel. Remarkable view even from the kitchen! Cook out your favorite grilled fare and take in the sights! You will be so glad you decided to stay! Take a stroll along the beach as you gaze across the waters surface. 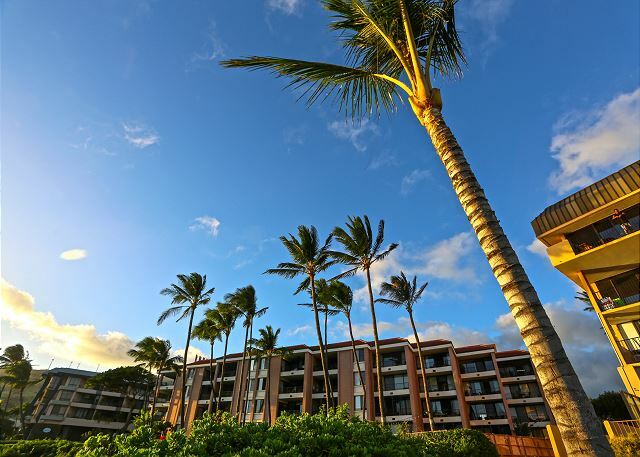 Cool your toes in the calm waters of the sea as you take in Maui's majesty. Comfortable and bright living room with flat screen TV. Full ocean views, from this stunning oceanfront gem! This newly remodeled unit has been upgraded down to the very last spoon! Our fully equipped, upgraded and well supplied kitchen makes it easy to craft meals for the family. Completed with high-end stainless steel appliances, granite counter tops and nice design touches, whipping up a meal is a pleasure. Your nicely upgraded, full bathroom comes with a tub/shower combo, linen and complimentary starter supply of toiletries. Venture out to snorkel or walk alongside the longest stretch of white sandy beach in the state of Hawaii, Sugar Beach. The entrance to Sugar Beach is a short, 2 minute drive from the complex. Spend a lazy, relaxing day by the pool with your favorite book. Grill up a quick dinner on the BBQ's and gather around to dine at the seating area with front row seats to the ocean and harbor. Walk a few steps beyond the property gates and stick your toes in the sand, collect tiny shells and bask in the sun. 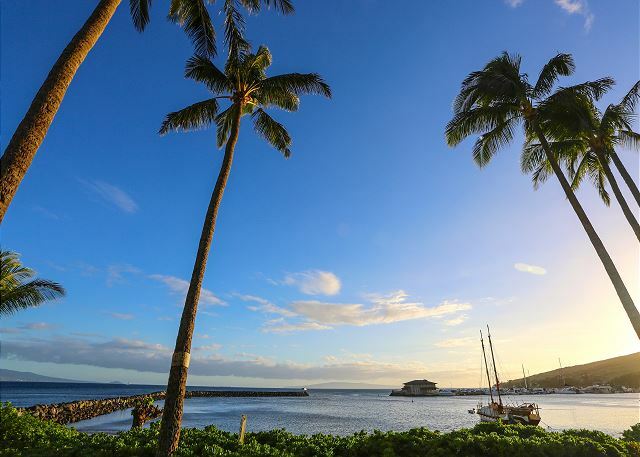 Spend the day at the Maui Ocean Center learning about marine life and Hawaiian culture, enjoy a tasty meal at one of many harbor restaurants and toast to a day in paradise with a tropical umbrella drink. At the end of the day you can unwind in your tranquil space, allowing the trade winds to cool you down. Kick back and cozy up on the couch in front of your extra large, smart TV for a movie on your preferred streaming subscription. Your bedroom promises a restful sleep in a brand new, king size bed. Enjoy beautiful Maui photo collection; printed on metal for high quality and stunning display of art. (The photography is credited to one the proud owners of this gorgeous property). Take in the breathtaking sunrise and sunset views while boats sail in and out of the harbor, spot turtles swimming and lounging on the beach fronting the complex and use the complimentary binoculars to enjoy your private whale show (when in season). Enjoy your island inspired meals on your own private lanai while basking in the incredible views from sunrise to sunset! 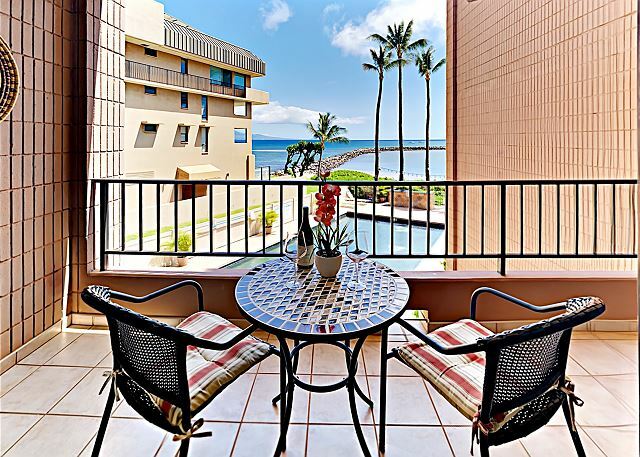 This condo is located in the quaint harbor village nestled between Maalaea Bay and the majestic West Maui Mountains. Enjoy the luxury of being miles from crowded resorts, yet convenient to all your most popular island activities. You'll enjoy being lulled to sleep by the sounds of the surf and the palm leaves swaying in our cool tropical breezes. The Maui Ocean Center is next door, home to Maui's world class Aquarium and a delightful outdoor center with shopping and dining opportunities. ROOM AMENITIES: Smoke Free environment, AC, Free WiFi, Fully Equipped Kitchen (Cooking range/oven, Refrigerator, Dishwasher, Microwave, Blender, Coffee maker, Dishes & silverware) Cable television, DVD/CD player, Ceiling fan, Private lanai, Iron and ironing board, Additional linens and towels, complimentary starter kit of laundry detergent, shampoo, soap etc. Hair dryer, Beach gear (beach chairs, beach towels and a cooler) Free parking. Our team is always available to be reached via email or phone. We have a Housekeeper on call; additional cleaning could be arranged at a fee, generally our long stay guests take advantage of this service. Our Maintenance crew is on call and can assist at any time. Check-in and Check-out are very simple. We send you a pre-arrival email that has all necessary information on how to get to the condo, how to access the unit and pool area, etc. We recommend you print the email prior to the trip or saving it on your smart phone to easily access it when you arrive at the complex. A private Concierge is always standing by to help with any activity bookings, island recommendations and restaurant reservations. Rooms Sleeps 4, Maui's best kept oceanfront secret, this gorgeous one bedroom, one bathroom unit with queen sofa pullout is sure to please! All new, high end furnishings throughout the condo bring you unlimited comfort! It's a must!